CLICK HERE to order Valobra Soaps. 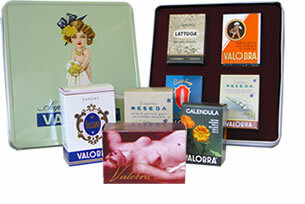 For nearly one hundred years, Valobra has been manufacturing soap in the tradition of the 18th century masters. Prized by socialites, rock stars, and regular folks too, Valobra soaps are crafted and produced in Genoa, Italy, situated in the heart of the French/Italian Riviera. In a region famed for its soap production, Valobra stands out as one of the world's finest soap makers. Try one of their legendary bars today!